A million monkeys typing on a million typewriters would eventually hammer out the works of Shakespeare, the theory goes. But could even they, in all their simian chaos, come up with a romance novel about Colonel Sanders? Yes, the Colonel Sanders, the fried chicken magnate whose famed blend of herbs and spices is now famous the world over? We’ll never know for sure, but one thing we do know is that a person can type out that book. Because it exists! To celebrate Mother’s Day—the chicken chain’s best-selling day of the year—KFC published Tender Wings of Desire [ED NOTE: !!! 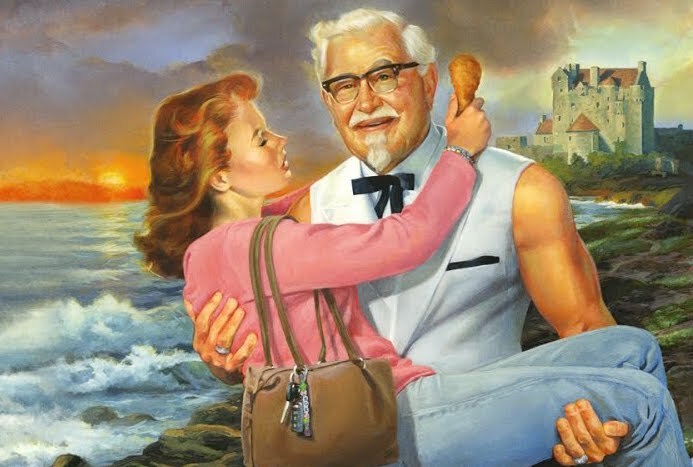 ], a novella following the love affair between Lady Madeline Parker and Colonel Harland Sanders … ‘The only thing better than being swept away by the deliciousness of our Extra Crispy Chicken is being swept away by Harland Sanders himself,’ George Felix, KFC’s U.S. director of advertising, said in a statement. Well, that last part about the deliciousness of being swept away by Colonel Sanders is something for other people to debate. For our part, what mother longs to celebrate her big day with a Kentucky Fried Chicken bodice ripper? Now, we are not ones to judge anyone’s reading habits but if you’re looking to buy a book for mom, why not start here?